In October 1945 the composer, who had now burnt his symphony, reluctantly agreed to let Finlandia-Kuva shoot a film at Ainola. The cameramen obtained footage of Sibelius on a forest path, sitting on a chair made from a tree root in a clearing called "the temple", and standing by the gate. The indoor photos were taken at the grand piano, and in the library, where Sibelius often listened to broadcasts and recordings of his works in the evenings. The short sequence at his work desk is interesting: Sibelius seems to be writing notes, but the tip of his pen is standing still although his hand is moving, as if he was trying to conceal the shaking. Jean Sibelius at home in different years: the footage begins in 1945. This is followed by varied material from 1927, including footage of Heidi, Margareta and Aino Sibelius. The film ends with the funeral in 1957. In December the composer's 80th birthday was celebrated. Sibelius did not go the jubilee concert, but he received jubilee delegations at Ainola. He also received gifts, not always of great monetary value - for example, the future mobile phone giant Nokia gave him their bestselling product of the time, rubber boots, in which he trotted along to the kitchen to amuse the servants. The neighbouring houses donated things that were valuable at a time when rationing was in force, for example butter, eggs and flour. 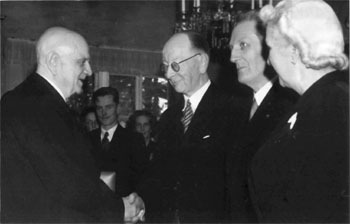 Jean Sibelius receiving guests at Ainola in 1945. Towards the end of the 1940s Sibelius showed that "the silence of Ainola" was not quite as complete as people have imagined. During a single night in 1946 he composed two new pieces for the ritual music of the Freemasons: the Hymn of Brotherhood and the Hymn of Praise. In 1948 he did further work on these songs and several other pieces of his Freemasonry music, in order to prepare them for printing. He also made an arrangement of the Finlandia hymn for mixed-voice choir. Sibelius was satisfied with his overall situation. "It is wonderful to be appreciated during one's lifetime," he said in an interview in 1947. "There are so many who never discover that their art has won its place." Aino, too, was pleased that her husband had become more stable: "During the last twenty years, things changed in one particular respect [i.e. drinking], and especially about fifteen years before the end all that had calmed down," she recollected later. The only annoyance was the composer's tendency to exaggerate even the most insignificant negative reviews, or any other aspersions on his reputation as a composer. The useless fretting kept him awake and was stressful to those around him. It was not until 1948 that Sibelius started to talk about his advanced age and to use it as a reason to refuse invitations to several Sibelius events abroad. His private secretary Santeri Levas considered that the composer's old age began that year, at the respectable age of 82. In the same year Sibelius gave his only radio interview, with Kalevi Kilpi from the Finnish Broadcasting Company. Sibelius said that he liked both big cities and forests. "Here in Ainola the silence speaks," Sibelius said magisterially. The interview tape conveys Sibelius's tendency to answer in a laconic fashion, without giving any real information. Kalevi Kilpi's radio interview on 6th December 1948 for the programme "Runo, sävel, sivellin" [Poem, Melody, Brush]; the programme deals with the cultural milieu of Lake Tuusula. One of Sibelius's last semi-official appearances was his 85th birthday party at Ainola in December 1950. Flashbulbs were popping, especially when the Finnish President J. K. Paasikivi greeted the composer. It proved to be a long visit: the two former pupils of Hämeenlinna Normal Lyceum discussed their memories of teachers and schoolmates during the 1880s. The election of J. K. Paasikivi as president. The 400-year jubilee of Helsinki. Paasikivi visits Ainola to greet Sibelius on his 85th birthday. Other Paasikivi films. he ridiculed. Of course, the article only provoked Downes's enemies. Because of these writings, they tended to brand Sibelius as the archetype of a conservative composer. In Germany, too, Sibelius had gone out of fashion after the Second World War. In lectures on modern music given at Darmstadt, Theodor W. Adorno instilled a generation of young critics and composers with distaste for Sibelius. People tried to conceal this reaction from the composer, but he was well aware of the heated arguments that took place in critical circles. As late as 1951 Sibelius said that he was writing a new symphony, but that he doubted whether he was still capable of getting it from his brain onto paper. He was still able to write smaller works: during the year he completed a new arrangement of his Opus 91b. The same year saw the start of the Sibelius weeks in Helsinki, and the composer met interpreters of his music such as Eugene Ormandy, Isaac Stern and Jussi Björling. The visits of artists continued during the festival in the years that followed. In 1954 Sir Thomas Beecham visited Ainola. It was not until the autumn of 1954 that Sibelius admitted that he could not complete the symphony. "I wrote a letter to Tali Paul [Adolf Paul's widow] with my own hand," he said in the autumn of 1954. "It was a gigantic work. But I still dream of being able to compose." Sibelius did manage to finish a new arrangement of Julvisa. 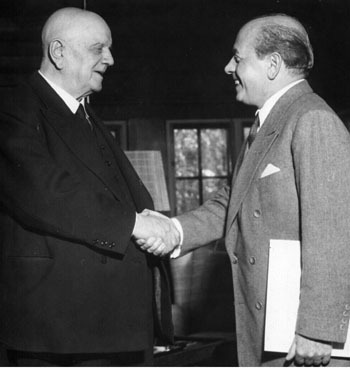 Jean Sibelius met Eugene Ormandy at Ainola in June 1951 (photo), and again in 1955. As late as 1955, Sibelius met Yehudi Menuhin, members of the Philadelphia Orchestra and the conductor Eugene Ormandy at Ainola. But in December 1955 the composer was spared from publicity: his 90th birthday was celebrated with his family. According to Jussi Jalas, the last years of Sibelius all followed much the same pattern, at least externally: "His health was good; he read, walked, observed nature and followed the events of the world, and especially musical events, via the radio," Jalas wrote. "But his contact with the outside world occurred mainly when relatives came to visit. He very rarely agreed to see visitors. Almost the only exceptions were the conductors and soloists who came during the Sibelius weeks. Their visits always inspired and cheered him." His private secretary Santeri Levas noticed the gradual fading of his powers. "During the last few years of his life the master was no longer himself. He very often sat in his chair in a corner of the library. In winter he did not go outdoors at all and even in summer only in fair weather." The composer no longer spoke of composing to his secretary. He had become resigned to the tragic fact that the eighth symphony would never be completed. The family still had to be on their guard lest the slightest aspersion on his global reputation made the old man depressed. In 1952 Sibelius had been devastated for weeks when Yrjö Suomalainen claimed in his biography of Robert Kajanus that Kajanus had given Sibelius advice on composition. The composer was also distressed by the works of his youth, which he considered of little value. Sibelius would probably have been horrified if he had known that fifty years later even his minor sketches would be performed in concerts and recorded.